a1000yoga Academy | Why Corporate Yoga? Home > Workplace wellness > Why Corporate Yoga? The traditional definition of Yoga according to Patanjali’s Yogasutra is to ‘cease all the fluctuations of the mind’. It helps integrate the body mind and breath thus enabling us to be in harmony in all aspects with ourselves and with others. In short, it is an ancient and time tested art and science of healthy living. 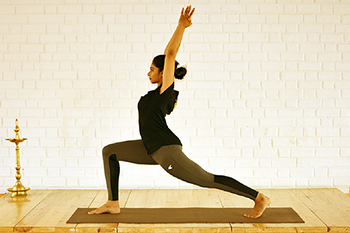 Most current yoga styles and practices concentrate on just Asana (postures) and Pranayama (breathing techniques). 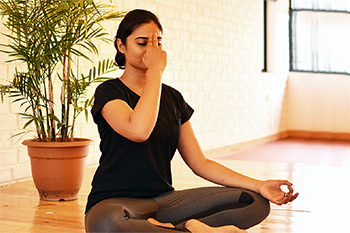 Asanas and Pranayama Breath techniques are a great way to start the yoga practice and can fit in with the regular fitness schedule. Regardless of the style of practice, one chooses, it is important to dedicate time to this whether it is twice a week or thrice a week. The effects of yoga are seen through repetitive practice and its benefits are many and at all levels. The practice of yoga is such that if you are regular, you can only see the positive impact increase as you journey with your practice. Whether it’s your thought patterns, emotional balance, physical fitness, social interactions it has far-reaching effects in all areas of your life starting from YOURSELF. We at a1000yoga Academy are committed to delivering this slice of personal and social wellness with a team of certified teachers from our Academy who are well taught to teach yoga keeping the current lifestyle and conditions in mind. More and more companies are realizing that yoga is helping cut operating costs as yoga helps in reducing sick leaves and increases productivity. Yoga is an organic way to health which can be used to achieve better motivated and healthy workforce. It’s a low cost and innovative way to reduce stress at the workplace and promote well-being. A company’s performance depends on its key assets which are their employees. All the top organizations realize the benefits of a stress-free workforce. A good yogic regime gives pain-free body, a stress-free mind, clear thinking and a positive outlook. It is easier for the employees to practice at the office, as it is increasingly difficult for them to take out time out of office. Recent studies indicate that companies save 3$-6$ on investing 1$ in well-designed yoga programs. According to a recent ASSOCHAM survey based on interactions with about 1,000 employees between 25-35 years working in 100 small, mid-sized and large organizations, across various IT and Non IT domains, around 35% of fitness enthusiasts working in India’s corporate sector prefer joining yoga classes rather than going to the gym. It showed a majority of respondents preferred the ancient practice to other fitness regimes, since it produced positive outcomes like improved social-emotional skills. Regular practice of yoga, gave the participants mental strength to face various challenges, besides giving them good health and improved immunity. “Yoga teaches universal values that are often referred to as life skills, it helps enhance social and self-awareness, self-management, relationship skills, and leads to responsible decision-making,” said D S Rawat, secretary general of ASSOCHAM while releasing the findings of the chamber’s survey. According to the National Institute of Health, 9.5% of Americans practice yoga. As yoga continues to grow, more studies are showing the mental and physical benefits. According to a randomized controlled trial at Johns Hopkins,(1) two groups of participants were assigned to a waitlist or to twice-a-week yoga and an at-home yoga practice. After 8 weeks, the yoga group showed a significant reduction in pain as well as better moods, improved physical functions, and increased energy levels. Moonaz SH, Bingham CO 3rd, Wissow L, Bartlett SJ. Yoga in sedentary adults with arthritis: effects of a randomized controlled pragmatic trial. J Rheumatol. 2015;42(7):1194-202. doi: 10.3899/jrheum.141129. Wahlstrom M, Rydell Karlsson M, Medin J, Frykman V. Effects of yoga in patients with paroxysmal atrial fibrillation – a randomized controlled study. European Journal of Cardiovascular Nursing. 2017;16/1):57-63. doi: 10.1177/1474515116637734. Woodyard C. Exploring the therapeutic effects of yoga and its ability to increase quality of life. Int J Yoga. 2011;4(2):49–54. doi: 10.4103/0973-6131.85485.